As Christmas is nearly upon us and everyone is thinking about turkey, sprouts, pigs-in-blankets, and a whole host of other assorted festive requirements, allow me to distract you with some fire, smoke, and meat. You know you want me to…. Temper is the brainchild of meat and BBQ maestro Neil Rankin and occupies a wonderfully smokey basement in London’s Soho (there is also now a branch in the city). Neil has worked for Barbecoa, Pitt Cue Co, and also opened the excellent Smokehouse in Islington – he is a man who knows his meat and, most importantly of all, knows how to cook it. As you descend into the dining room from street level, your nostrils begin to tingle with the earthy smells of smoke and charcoal, a background hum of the outdoors that is hovering in the air and undercut with the soothing aroma of meat being cooked over coals. Once at the bottom of the stairs, a huge indoor fire pit is revealed, a clay oven at one end, various racks and grills at the other, and a counter that runs all the way round for diners to revel in the sight of meats (and fish) being lovingly, simply prepared and cooked before their eyes. It’s quite a statement and one which is sure to melt the heart of any BBQ fiend. For those who prefer a more traditional dining experience, tables away from the fire and smoke are also available, although I’m not sure why you’d want one! The emphasis here is, obviously, on meat but don’t come expecting St Louis ribs or chicken wings – this is a different BBQ game. Starters come in the form of soft tacos – baked to order – and with a range of toppings like crab and pickled onion pork skin, prawns, or the wonderful Aged Cheeseburger; Small patties of beef, charred and juicy, with a slab of melted cheese served on piping hot, soft tacos are truly a thing of beauty and wonder and could, if ordered generously, satisfy as a main in their own right. A simple but delicious beef fat taco is worth a go as was, on one visit, the wonderful tuna and salsa offering which was clean, punchy, and utterly delicious. Mains are, for the most part, ordered by 100g portions and they suggest two or three to share for two people plus some sides. I’d normally skip sides to focus on more meat but do not, under any circumstances, skip these sides – beef fat roast potatoes covered in grilled, tangy Ogleshield cheese are truly sensational and a wonderful gluttonous treat. Likewise, the grilled corn with lamb fat bearnaise is a fabulous dish – some of the corn is popped to add an extra and exciting texture, the creamy, unctuous sauce cut perfectly with a dusting of mint. And of course, both of these sensational sides go perfectly with the hunk of smoked meats that come served on freshly griddled flat bread. Goat is rich, deeply flavoured and utterly moreish, demonstrating here why it is a meat we need to eat more of – totally delicious and increasingly available. If you think you don’t like goat or are too scared to try it, go to Temper and have some and all your worries will be over. Likewise if you’ve ever been slightly disappointed by dry, soulless BBQ beef then the charred, moist, and wonderful offering here will sooth any previous beef trauma. Also worth diving in to is the beef and marrow chilli which comes with fresh, spicy jalapeño and sings with delicate, fresh flavours of lime and coriander – a perfect example of what many restaurants only vaguely achieve. To follow this fresh-faced feast, the warm baked cookie with a scoop of vanilla ice cream is an absolute must and comes served in the pan it was baked in. Gooey, sweet, sticky, indulgence of the highest order and well worth saving some room for (although on both visits we ended up sharing one between us). Wine is available by the glass or bottle with a very decent selection of grapes and prices – house wines start from about £26 – and there are various tempting cocktails and craft beers. It is worth noting that if you do sit by the counter, white wine will get warm quickly as the heat from the pit radiates towards you – be warned! Service is professional, relaxed, and of the highest standard and it is a marvellous place to spend a couple of hours, especially on a cold winter’s day. Dinner for two including drinks and service is about £100 but if you skip starters it’ll come in at nearer to £80 – but with food of this quality this is fantastic value. There are few places where you can enjoy such fantastic food in such an exciting and unique environment and Temper ticks the boxes for being one of the finest meateries around. And is more than worth returning to for feasts of meat and fire. It is tempting, when you find a gem of a pub lunch, to keep it yourself and sneakily return again and again merely to satisfy your own gastronomic desires and revel in the fact that no-one else knows about your secret. However, it is equally tempting to shout loudly and rejoice, to share your discovery with the world and tell anyone who’ll listen that they simply must try it. They must. Simple. The Royal Oak had been on my radar for some time and I’d marked it out as a place to investigate as I’d read many great things and thought it sounded just like my sort of place. The little village of Bishopstone nestles beneath the flanking escarpment of the Ridgeway on the Oxfordshire/Wiltshire borders and is just the kind of place that one would hope, nay expect, a fine pub with an excellent kitchen. The sort of place for balmy summer barbecues, autumnal pints, and warming winter suppers. And, with The Royal Oak, the locals are blessed and lucky enough to have such a pub. Helen Browning has a well earned reputation for excellence with regards to organic farming and animal husbandry and her farm is based in the village with pigs and sheep roaming the nearby fields. In fact, you can even book a farm tour and see the happy animals for yourself, although some diners may prefer to eat before they meet the meat. Some years ago, she took over the pub in Bishopstone and quickly established it as one of the places to eat in the area. And with organic meat and veg supplied on its doorstep, a network of excellent local and national suppliers, and an excellent selection of beers, ciders, and wine, it is no wonder that it quickly became a hit with rural gastromomes and discerning scoffers. Annoyingly for me, it always seemed a little far from we usually stay for a gentle evening meal after a day walking the countryside, so for some time it seemed ever so slightly out of reach. I could have driven of course but then ale wouldn’t have an option. Or wine. And that wouldn’t do at all. However, while organising a pre-wedding trip for a friend, I discovered that they do offer a free land-rover ride home for up to ten people so I booked a table and made the necessary arrangements. We arrived and were greeted like old friends, beer at the ready and some plates of homemade sausage to nibble at while the table was prepared.The Royal Oak is a Victorian building with a very snug interior and tables rambling around a generously sized bar. The menu is straightforward and tempting with an array of pig-based dishes as well as excellent sounding vegetarian and fish options. We ate a vast amount, drank a vat of wine and beer, and tumbled into the rickety land-rover for a bracing drive back to where we were staying. It was only the next day I realised that while we were eating, the laughs and merriment had given way to silent, appreciate devouring of some of the best food any of us had had from a country pub. And I can safely say that, having returned several times since, The Royal Oak is up there as being my favourite pub to eat in in the country. No joke. The sticky, tender spare ribs (available as a starter or main course) hint at oriental flavours and would satisfy even the hardiest BBQ fan. Their burger is fat and juicy and can be customised with extra cheese, pickles, egg, and bacon and is served with chips that rustle for your attention. A main of pork belly with root mash, roast potatoes, and cabbage consists of two hugely generous slabs of rolled pork, cooked slowly to produce tender, juicy meat that flakes apart as you cut through it. A rich, herby gravy and vast fluffy Yorkshire pudding complete this mighty take on a pork roast and a bargain at £15. Also highly recommended is the pig cheek ragu – outrageously tasty meat in a hefty sauce which fills all the corners and comforts the soul. 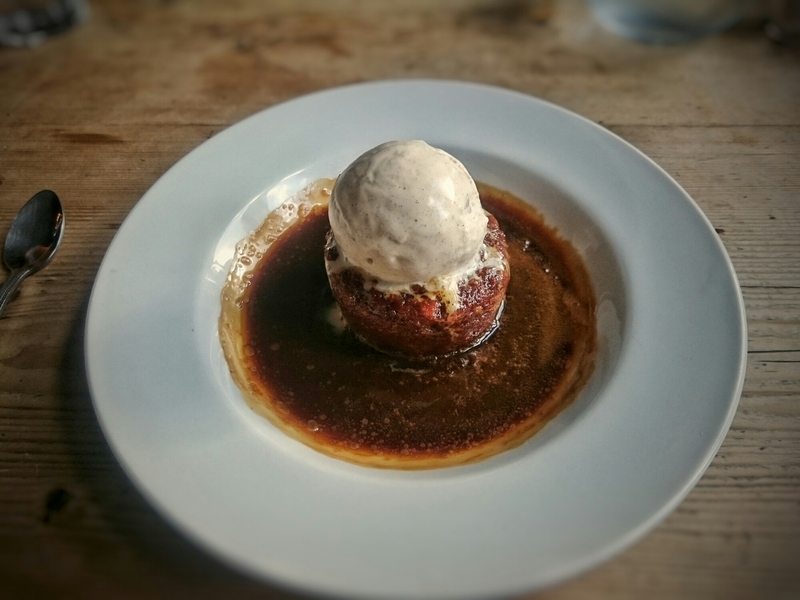 Puddings (all £7) are simple and wonderful – apple crumble, organic ice cream, sticky toffee pudding were all jostling for attention on a recent visit. The sticky toffee in particular is a thing of true beauty with a decadent toffee sauce soaking through a rich, spicy sponge and topped with a scoop of organic ice cream. The stuff that dreams are made of and tasty ones at that. All the staff, and especially the landlord, are friendly and jolly – happy to chat or recommend anything that is enquired about, be it how the pig racing went or whether we should listen to the blackboard and try the organic ale on offer (we did, it was amazing). They (rightly) get busy at weekends and it is worth booking ahead if you’re making a special trip. There was a relaxed and pleasing sense of mild irreverence that immediately appealed and this is part of what makes the place so good – no pretensions, no snobbery, just passion and pride. And that is something lacking in many eateries in the world right now. 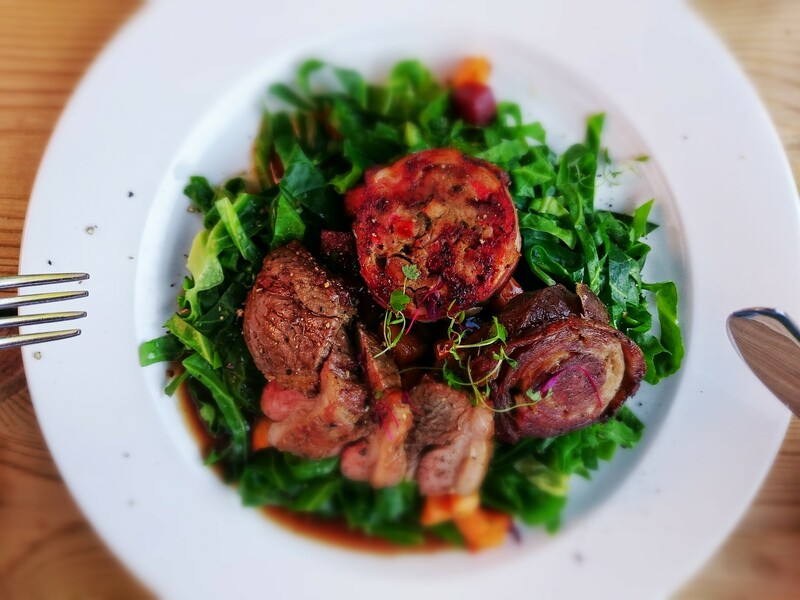 So if you want to eat in a genuinely friendly environment which serves consistently excellent and lovingly prepared food, head to The Royal Oak and rejoice – we always do. Tucked up on a quiet street just away from the noise and bustle of Piazza Navona and directly outside the achingly beautiful church of Santa Maria della Pace is the wonderful haven of La Focaccia – home to serious wood-fired cooking and some of the best fritti in Rome. When we first discovered it in 2010, there was no sign outside and the only reason you’d realise it was a restaurant at all was due to the red gingham tablecloths that adorned a few al fresco dining spots. At the moment (well, when I returned in June 2016), the entire street is pretty much covered with hoarding due to building work and the team from La Focaccia have taken the opportunity to do a little fresco outside which features the restaurant name in bold letters, thus making locating this wonderful eatery all the easier. If you eat inside, it’s a little like entering the vaults of a church (and given the location, you most likely are) but a church with old wine bottles, rusted signs for beer, and a random mix of old tattered posters on the wall. None of this is a bad thing – it is welcoming, comforting, and downright intriguing as you wend your way down slanted stone stairs to discover the expansive underground dining areas that spread underneath the streets. On our first two visits, the whole place was full of priests discussing whether they should pray for a friend before or after dinner, on my most recent trip, one whole side of the dining area was filled for a birthday party and we could hear the increasingly raucous and joyous celebrations out on the street where we were sitting. The bottom line is: Everyone loves La Focaccia. Their pizzas are truly majestic creations – thin bases with a rich tomato sauce and a good (but not overly long) selection of toppings. I can’t resist a Pizza Diavola with slices of spicy salami covered in melting cheese, finished with a drizzle of chilli oil and a scattering of basil and the ones served at La Focaccia are sensational. The bases are scorched to within an inch of their lives in the fierce wood-fired oven and come out crisp but still with enough satisfying chew to delight any pizza lover. The slices of salami are huge and only three or four are needed to nearly cover the already vast pizza base. When it comes to size, the same can be said of the decadent Calzone – a folded pizza stuffed with veggies or meaty treats that only just fits on the plate. Huge and over the top but so worth it. I have eaten pizza all over Italy and this place serves some of the very best. No joke. The pasta is also worth exploring – a Tuscan-inspired wild boar ragu was deeply meaty and rich with sizeable chunks of meat cooked to tender perfection in a simple but delicious tomato and wine sauce. A simple tomato ragu with huge cubes of mozarella accompanied with one of their crisp and delicious breads is also a winner. Wine is available either by the jug or by the bottle and I urge you to opt for the della casa and get a good carafe of crisp local white or a cool, slightly chilled red. Chilled red wine is something that many people would baulk at but is also something that everyone should have – it is beginning to make more of a splash over here and is truly fantastic. Not all reds are suitable of course – a rich and earthy vintage would certainly not benefit from a spell in the chiller – but for light, fruity wines it is fantastic. And about €10 for a litre. Score. The staff are multi-lingual and incredibly friendly and every time I return I rejoice – it’s a bit like coming home. I can’t envisage a trip to Rome without a dinner there and I think that just about sums it up – when in Rome, eat at La Focaccia! I was very, very excited when I discovered this place during some web-based research for possible tasty destinations. After all, I was in Rome to visit my ‘Meat-wife’ (my real wife is a vegetarian) who has shared some of the best BBQ the UK has to offer and who has recently moved to Rome to teach. She told me that she really, really missed the kind of meaty treats that we had gorged on every month so I felt it my duty to find somewhere. I wasn’t expecting much to be honest – at best I thought I might find a sort of TGI-Friday sort of faux American monstrosity – but I was thrilled to find that in 2013 a group of Italian BBQ enthusiasts opened this welcoming place on the West bank of the River Tiber. They take their craft very seriously, lovingly explaining on their website the importance of low and slow cooking and the miraculous flavour that smoke imparts to meat. They meant business. We had to go. In true tourist fashion we arrived for dinner WAY before the locals – the place was empty at 7pm but the tables were dotted with reservation markers for 9pm and beyond – but like the troopers we are we were not put off. 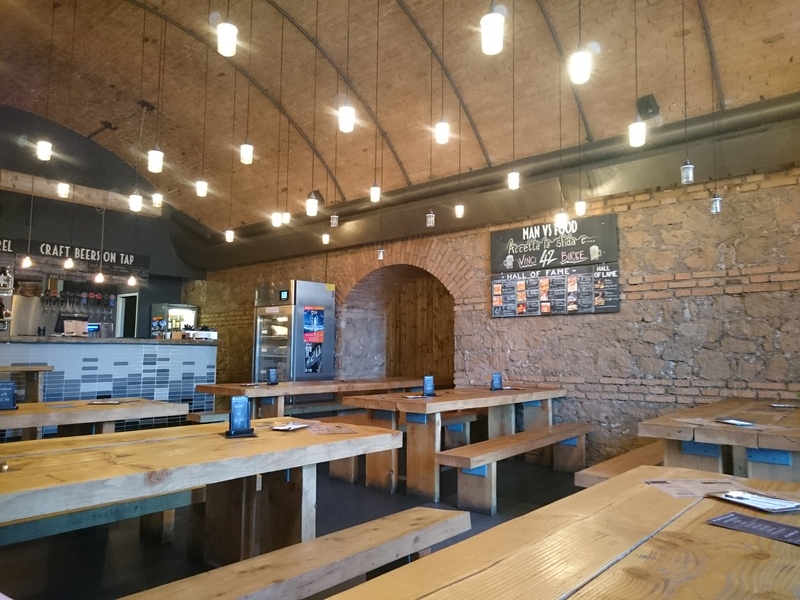 Smoke Ring has set up home in a brick archway and if you have been to any BBQ joint pretty much anywhere in the world, as soon as you walk in you’ll feel right at home. Light bulbs dangle uncovered from the ceiling, a huge rack of barrels full of liquor are stacked on one wall, signs behind the bar offer craft beer and cocktails – it is every inch the smokehouse that anyone would expect. Yes it may seem a bit tired to those who have tried many (not us however) but finding this kind of place in Rome is both comforting and refreshing. We took a seat at one of the many communal tables and had a look at the menu – eager to see what we could cram into our bellies. Meat is sold by weight (or portion in the case of ribs and wings) and you grab a tick-box form from the table, wonder how much meat you can get away with, and then take your filled in form up to the bar to pay. 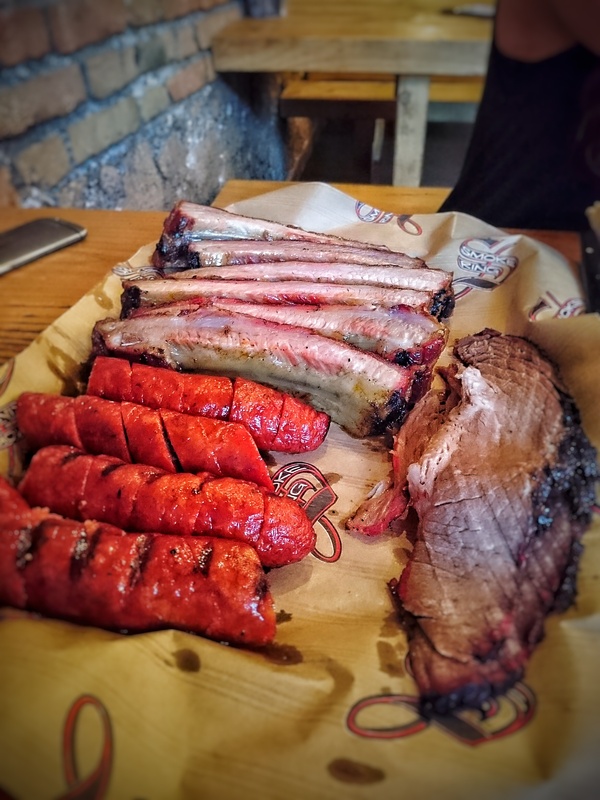 We ordered ribs, brisket, pulled pork, hot links, and chicken wings along with a bottle of an amber coloured wine from Lazio – as we weren’t sure on portion size, we went for 6 servings of ribs, 200g each of pulled pork and brisket, 2 portions of links, and 5 hot wings. This proved to be possibly rather excessive. The ribs were St Louis cut – fat, juicy and huge. They had been gently seasoned with a simple but tasty rub and smoked to perfection – a nice bark and the meat clinging to the bone. I would perhaps have appreciated a glaze of sauce to finish but they were pretty fantastic all said. And six was far too much even for us (we managed four). The brisket came sliced thin which revealed the rouge ring imparted by the smoker and was savoury and delicious but possibly a little dry. The servings of links turned out to be two huge sausages cut into generous portions – we were very nearly defeated by them – and were some of the best that I’ve had, spicy and smoky with a satisfying snap when bitten into. Wonderful. Wings were also excellent – smoky, succulent, and pleasingly messy. The pulled pork was not half bad either and packed a deep, porcine punch with just the right amount of rub and a top quality amount of smoke for flavour. This is hard to do – Smoke Ring do it VERY well. The only slight let downs were the two sauces that came with the wings and pork – one was supposedly a standard BBQ sauce but in reality tasted a bit like ketchup with a bit of oregano thrown in, the other was a supposedly spicy number but lacked any real kick. That is not to say that either were unpleasant but given the quality of the majority of the cooking it did come as something of a disappointment. But for all that meat and a bottle of excellent local wine we paid the grand total of 55 euro which was more than good value. By the time we left the place was filling up nicely and I certainly intend to visit again the next time I find myself in Rome and if you find yourself craving some serious carnivorous delights when you visit, this is the place to go. Sometimes you walk into a restaurant and immediately know that everything is going to be alright. There is something about the decor maybe, or the staff, or the smells, or the general vibe that instantly ticks all the boxes and makes you feel reassured that this place is everything that you have been looking for. It is very rare for somewhere to have this effect on the diner, sometimes it is the sheer unexpectedness or unappealing looks of a place that then serves killer food that make a particular restaurant somewhere special and worth seeking out, but I have to say that Atomic Burger had me smiling and happy from the moment I walked in and that feeling has remained with me pretty much ever since. I first encountered this remarkable mini-chain (they have a branch in Bristol and a pizza place nearby) a couple of years ago when my wife was working in Oxford and I had come to stay with her for a couple of days. I spent my teenage years in the city and have many fond memories of its pubs and majestic medieval beauty, gigs, and parties, but I never really saw it as somewhere to eat out. To be fair, we didn’t really want to spend our precious pennies on food when there was beer to be had but Oxford never really felt like somewhere for exciting gastronomic adventures. I’d read about Atomic Burger in the Hardens food guide and, as I was aiming to visit the tiny cinema (The Ultimate Picture Palace) nearby, I thought I’d check it out. The Cowley road was always a bit of a rough affair when I was growing up but I’d played and seen many gigs in the pubs and venues that were scattered up and down it and was feeling nostalgic. And surely the area must have been cleaned up a little bit since 1999. When I walked in my jaw nearly hit the floor. I had never in my whole life seen anything like it. For anyone born and brought up in the 80’s, it was a dream come true. It was like a realisation of the toy section from the Argos catalogue in 1987. It was like the bedroom you wished you had when you were a kid. It was wonderful. Hanging from the ceiling and stuck to the walls were all the toys and actions figures that I pined after as a child – figures from Star Wars, Boglins, My Pet Monster, Thundercats – you name it, it’s probably on their wall. There was a huge TV screen playing cartoons at the back of the room, there was a warmth, a glow, a joy that radiated from the place. A relaxed and friendly waiter showed me to a table (I just about managed to stammer a ‘hello’ so completely bowled over was I by the decor) and I looked at the colourful and intriguing menu. Normally I would shy away from a burger place that has a vast selection of toppings – it’s often a way of hiding the fact that they don’t really do anything well – but there was something about the Atomic menu that felt different. Each burger has a film or pop culture name or theme – The Tony Montana, The Daisy Duke, The Jake n Elwood – and each is customisable to the point of, well, as far as you want to take it. What makes it even more interesting is the option of having any burger as either beef, chicken, or veggie, thus allowing for everyone to dive in and enjoy the fun (gluten free buns are available too). All the toppings are fantastic – the pulled pork, the crispy onions, the dressing, the hot sauces (although be warned that the Atomic Fallout Sauce is lethal), and everything is made with love and passion and that joy that permeates the building. On that first visit though, I went down a slightly different route and ordered a hot dog. Plain and simple. Each main comes with a free side and of these, the chilli-rubbed ‘sci-fries’ spoke to me, as did a starter of BBQ wings. And a beer. Obviously. My order was taken and I sat back and felt very happy indeed. When the wings came I was, well, more than a bit surprised. I have eaten many a chicken wing starter in my time and was expecting maybe 4 or 5 wings to come my way. This particular portion consisted of closer to 12, covered in a rich and smoky BBQ sauce, and served with a suitably sized stack of napkins and a side of blue cheese sauce. Heaven. The wings themselves were expertly cooked and the sauce was thumpingly good. I think I inhaled the lot in about 5 minutes. The hot dog was vast – a proper frankfurter that was juicy, slightly smoky, 100% amazing, and also gone in seconds. The chilli-rubbed fries that rustled together enticingly in the bowl were a revelation – hot and deeply savoury, crispy outside with a perfectly cooked fluffy centre. And, like the rest, devoured at an alarming rate. The waiter came to ask how everything was but I’d already finished. I knew I’d found somewhere pretty special and was so excited by it that my wife and I went back the next day for lunch – I had a chicken Daisy Duke (bacon, American cheese, BBQ sauce) and she had a veggie Bandit (Cajun-rubbed pattie, huge onion ring, BBQ sauce, cheddar). They were totally awesome. The burgers were massive but not scarily so – and we staggered out happy and full, unable to manage one of their tempting milkshakes or ice cream desserts. Since that first encounter I have eaten at the Oxford branch 4 or 5 times – the latest to their newer premises a few doors down from the original and we got the train from London especially to eat there – and the Bristol branch once. Every time I have been filled with joy, nostalgia, and fantastic food. The beef burgers are hefty, juicy, and fantastic. The wings continue to deliver on every level (a large portion is more than enough for two – trust me). The staff continue to be utterly brilliant. I’ve had some of the biggest onion rings known to man, a crunchy exterior with properly cooked onion hiding inside, as well as creamy and delicious slaw, and more of those addictive ‘sci-fries’. The plain fries are pretty epic too I should add. And every month there is a different special burger to tempt you with – The Wicker Man creation last year was truly epic. On my last visit I created my own – the Hans Gruber tribute (look it up if that film reference means nothing to you) which featured crisp dill pickles, BBQ sauce, Swiss cheese, tumbleweed onions, and a whole frankfurter crammed atop a mighty beef patty. It was truly amazing. And I should also add that, unlike every other burger chain or restaurant in the land, Atomic do not use a sweet, enriched brioche bun to contain their vast creations. A simple white roll is all they feel is necessary and I have to say it works completely. Some people may take umbrage with this. Some may wax lyrical about the qualities of an enriched dough that will help keep the whole thing together without dissolving into mush before the burger is finished. Some may say the richness of the bun works with the burger. Some perhaps can’t imagine why you wouldn’t use a brioche bun. Some say they thought the Sun and the Moon were the same thing. People say all sorts of things. I’ve had some delicious burgers – Honest Burger, The Joint, Pattie & Bun to name but three – many of whom opt for a brioche-style bun but I have to be honest and say that the only time I’ve noticed the difference was when I was served a burger in a brioche bun that had clearly been toasted hours earlier and was chewy and unpleasant. Atomic’s traditional rolls more than stand up to the task (and are also pretty damned tasty) of holding an unruly burger in place and surely that is all that matters. Atomic Burger is a real destination and one well worth seeking out. There are whispers and rumours that they may expand beyond the current sites and if they do we should all rejoice. Their concept (not a word I usually associate with good restaurants) is unique and wonderful and the food more than lives up to the expectation set by the surroundings. There is even awesome Star Wars wallpaper in the toilets. Yes. There is. They are soon (early 2016) unveiling a new menu which I’m sure will be every bit as exciting and epic as the current one and I can’t wait to go back and try it. There is nothing else out there like Atomic and that is worth celebrating and cherishing. If you like burgers, you will love Atomic. It’s that simple. I was tempted to call this post ‘Possibly the best soup ever’ simply because it gives me so much joy every time I eat it. One of the many wonderful things about this recipe is that, unlike many so-called ‘meal’ soups, this really does fill you up in a truly satisfying way. No jokes – it really does. It is also perfect for cold nights and for when you need to make a change from seasonal excesses. The first time I encountered a ribollita (Italian for ‘re-boiled’) was in an early episode of the ‘River Cottage’ series in which the ever dependable Hugh Fearnley-Whittingstall created a version that he dubbed ‘Half-the-garden Soup’. It certainly did contain a fair heft of veg and I was slightly disappointed not to find a recipe for it in the original (and excellent) ‘River Cottage Cookbook’. The version that eventually appeared in the (also excellent) ‘River Cottage: Veg Everyday’ cookbook was splendid and tasty but for some reason didn’t quite fulfil the warming, wholesome temptation that the original TV series seemed to offer. No matter, there were many other ‘hefty’ soups in the book and I was soon distracted and not musing too much on the lack of ribollita in my life. However, the thought of a filling, simple, delicious vegetable soup that delivered a bit more punch than usual kept coming back to me. So I turned to the internet to see if any variations existed and lo and behold, Hugh himself provided the answer! One of his weekly columns for The Guardian was based around tinned ingredients and, much to my delight, the first recipe he offered was for a ribollita. Joy! And so, on a cold autumn night, I gave it a go and the results were, well, more than stupendous. Seriously – this soup is something else. So excited was I by the success of the ribollita that I made it again the following week. And I made it for dinner last night. And we’ve got more for dinner tonight. I’ve tried to work out what makes this recipe superior to the version in the book and the only thing I can really spot is the addition of wine. Wine generally makes things better in my book and you’d have thought that perhaps 100ml wouldn’t make much difference but believe me, it is the difference! The other elements that really help this soup pack a serious punch are the slow cooking of the onions (15 minutes) and then the simmer of the whole soup (about an hour). This may seem like a bit of a faff time-wise but I implore you to be patient and go with it – I’ve tried doing a faster version and it just doesn’t satisfy. You could use the time to drink more wine for example. The only I’ve changed from the original recipe it the amount of olive oil used to soften the veg – I find that 2tbsp is more than enough – but use however much or little as you please. Again, the oil is a key part of the flavour so don’t leave it out entirely as you will miss it. The soup does taste better when left overnight but you might need to add more stock as the liquid does tend to get absorbed by the veg. The recipe states it will serve six to eight people however, we are greedy and find really we only get four big portions from this quantity! In a large saucepan, warm the olive oil and sauté the onions over a medium-low heat. Cook them for a good 15 minutes, stirring occasionally, until they are soft and glistening. Add the carrots, celery and leek, and cook for a further five minutes, stirring and then add the garlic and stir for another minute. Pour in the wine and simmer for a minute – this makes everything SO much better. Add the tomatoes, beans, stock, rosemary and thyme, season and simmer gently, partially covered, for about an hour. Use this time to drink wine. Add the greens and cook for 10 minutes more. Remove the herb bundle and season to taste. Once the soup is done, rub the bread with garlic, brush with oil and toast until golden and delicious. Put one slice in the base of each bowl, ladle over the soup, and shave over a healthy amount of parmesan. If you like, splash a bit more olive oil over the steamy pile of warming delight and tuck in. Whenever we go camping we treat ourselves to a meal at one of the local pubs. Obviously my ability to get out and about into the countryside has been somewhat hampered of late but I was able to drop by an old favourite quite recently and was very glad I did. The Vale of the White Horse in Oxfordshire is certainly not lacking in idyllic village pubs that serve food. Almost every hamlet you pass will have a sign extolling the virtues of their particular local haunt and why you should stop and eat there immediately. Interestingly enough however, most of the claims in this area do appear to be pretty accurate – in a world where more and more pubs are putting the kitchen before the beer and generally resulting in more and more opportunities for terrible cooking, generic menus, and trend-chasing, this is worth taking note of. The White Horse is located in the almost achingly beautiful village of Woolstone – a mixture of black and white timbered cottages, 18th century stone farmhouses, and a babbling brook that trickles through the centre. The pub takes its name from the Bronze-age chalk figure carved into the downs that rear above the village and over the last few years it has been carving a reputation as a serious contender for best eating pub in the area. And there is some seriously stiff competition – Helen Browning’s magnificent Royal Oak in Bishopstone and the Blowing Stone Inn in nearby Kingston Lisle to name but two. The first time we ate at The White Horse we not particularly impressed – the food was fine but overly styled and underly flavoured as if the chef had been watching too many episodes of MasterChef and not bothered to taste the food before it was delicately arranged on the plate/slate/board. A lemon chicken that tasted too much of lemon and not enough of chicken but looked like it had come out of a food-styling manual, scampi and langoustines that cascaded out of a bucket of chips but tasted like they’d come from a supermarket – these were conundrums that were coming out of the kitchen. All style, no real substance. That, however, was in 2011 and things have since changed in a big way and now the careful and exact presentation is matched by flavours that sing and dance around the palate in happy harmony. Don’t get me wrong – there are no Michelin pretensions here, no foams, airs, sous-vides, or the like, but there is serious, straightforward cookery that takes pub staples and makes them deliver beyond expectations. 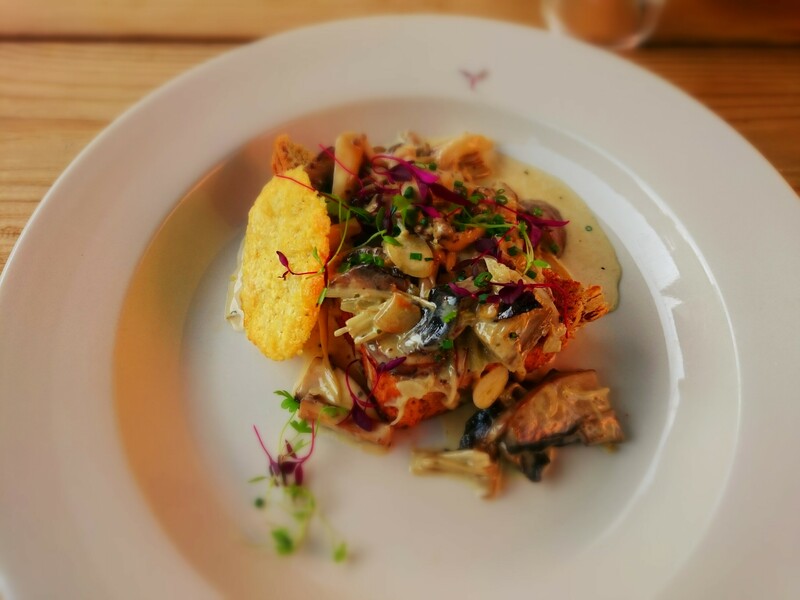 A starter of wild mushrooms in a creamy garlic sauce was rich and satisfying but still perfectly judged as a first course – a delicate parmesan crisp complimented the lovingly cooked fungi and added a nice bit of extra crunch. Likewise the duck pâté was beautifully smooth and served with a simple salad, chunky toast, and a zingy chutney that brought the whole dish together. 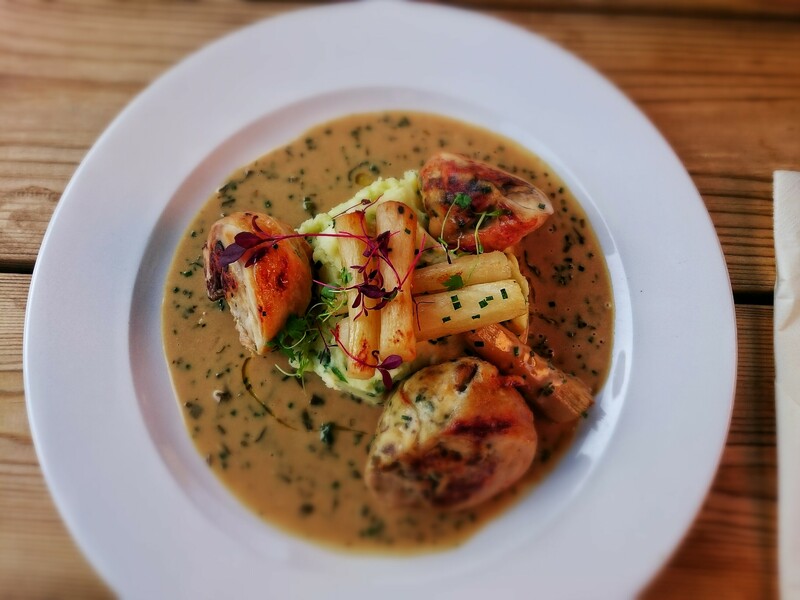 Mains also deliver – mushroom-stuffed chicken thighs served with salsify (a tricky root to get right), buttery mash, and a lick-the-plate-clean mustard and tarragon sauce was expertly cooked and consequently devoured in minutes. Lamb three ways (roasted rump, crispy belly, and slow-cooked shoulder wrapped in pancetta) on a bed of spring cabbage, beetroot, and sweet potato was brought together by a wonderful light minty sauce that also had us chasing the final dregs around the plate. The lamb itself was delicious – the shoulder was so tender that the pancetta could barely keep it from falling apart on the plate and the crispy belly was a triumph. 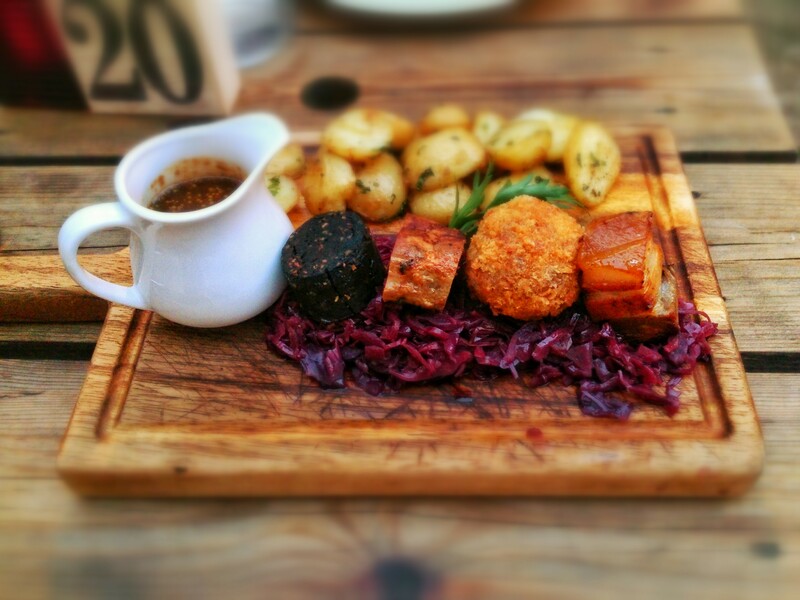 In a similar vein the Board of Piggy is also worth investigating with a lively combination of confit belly, smoky fritter, and black pudding served with crispy sautéed potatoes and a serious whack of braised red cabbage that will leave even the hedonistic pork-lover full and happy. There are also more traditional pub favourites like fish and chips, steaks, and a lunchtime menu offering burgers and sandwiches. And maybe next time we’ll give that scampi and langoustine dish a second chance – you never know. The vegetarian options are possibly a bit less imaginative – baked mushroom or a butternut squash ravioli – but if the meaty mains are anything to go by (or indeed, that mushroom starter) they should prove to be a cut above expectations. Puddings-wise the selection is limited but not under-thought – the treacle tart with ice-cream was a true wonder with thin, short pastry and a generous filling, served hot with a toffee ice cream melting on the side. From the description it should have been far too sweet but was actually just right. There is also the inevitable cheese board or ice-cream selection but there is nothing wrong with that – I recently opted for the classic combo of vanilla, strawberry, and chocolate and it was exactly what I wanted – nostalgic, simple, satisfying. After a few years of visiting the area, The White Horse has definitely become a new favourite and is well worth seeking out. They recently installed a vast wood-burning pizza oven in the garden which is fired up twice a week (must try and time our next visit right so we can try it) and the Sunday roast is fantastic, a vast platter of lamb, beef, and pork, rich gravy, fluffy Yorkshire pudding, and seasonal vegetables plonked in the middle of the table for everyone to dive into. Again, the vegetarian options are a bit unimaginative and I have to say I’m not sure I’d choose a vegetable stir-fry as a Sunday main but perhaps I should be a bit more adventurous. All of this great food is served in a friendly pub environment with a decent selection of ale and cider and a pretty decent wine list. Prices are between £5 and £8 for starters and mains range from the mid-teens to early twenties (the fillet steak tops the list at £25.95) which is pretty representative of the area in general and with food cooked this well is certainly value for money. 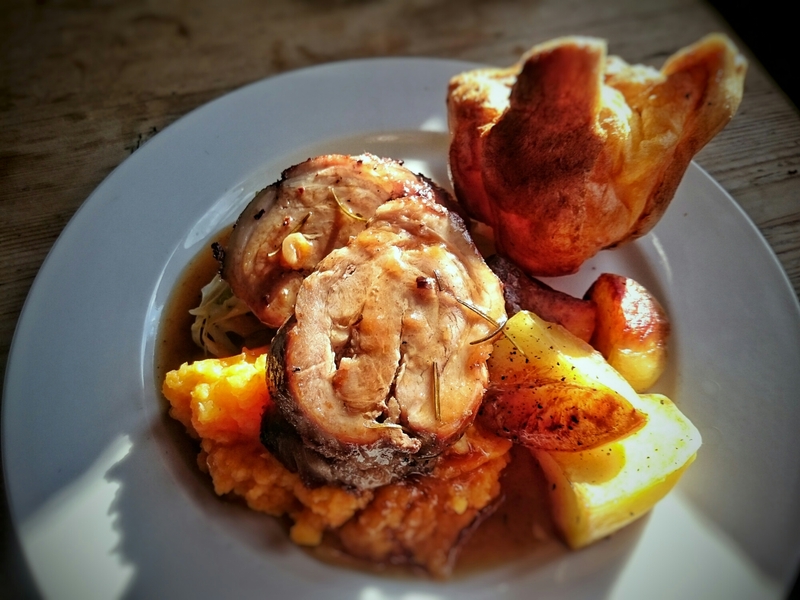 So if you find yourself rambling the South Oxfordshire Downs or are looking for a new destination for a decent country dinner, find your way to Woolstone and visit The White Horse – you won’t be disappointed.